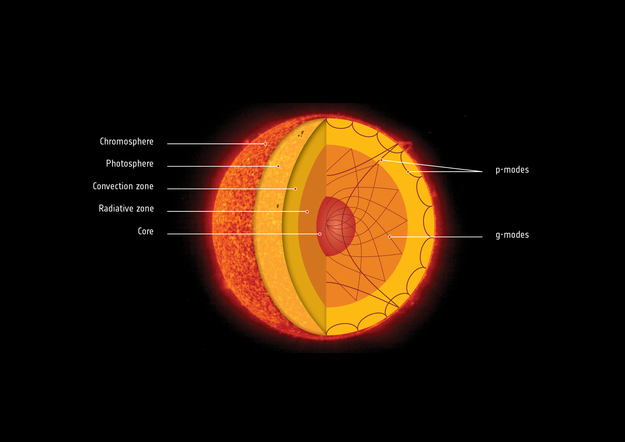 Just as seismology reveals Earth's interior by studying seismic waves from earthquakes, solar physicists use 'helioseismology' to probe the solar interior by studying the frequency and oscillations of sound waves reverberating through it. Higher frequency waves, known as pressure waves (p-waves or p-modes), are easily detected as surface oscillations owing to sound waves reverberating through the upper layers of the Sun. They pass very quickly through deeper layers and are not sensitive to the Sun's core rotation.